If you buy sweet and sour red pepper sauce in the international aisle at the grocery store I’m going to show you how easy it is to make at home for a fraction of the cost. You might also know the sauce as a sweet chilli sauce which many buy as a dipping sauce. This is just as good if not better… but I’m biased. Well it’s nearly time for all the kids to go back to school and this year all three of mine will be off on new adventures. I won’t try to hide my excitement knowing that I will have my kingdom to myself next week but that just means I’ll be even busier in the kitchen creating new recipes. You may also find around this time we see all the sales in the stores and we try to stock up for next season. Just the other day I noticed cases of Roma tomatoes on sale for $7.99 at Zehrs which is a great price if you want to can tomatoes for salsa, pasta sauce or just eat them up. I do try to prep for the winter months and do all my meal planning so that it’s an easy transition from autumn to winter for us all. I know you must think I’m crazy but being organized in the kitchen has helped my husband and I keep the family on the go especially when it comes to meal time. The boys have football practice and games right up until November so as winter creeps upon us I try to do more hearty hot dishes and soups. Those types of dishes are easy meals that my family can have on the go. I was on my pink sticker hunt the other day and came upon some sweet red peppers. A pink sticker is simply a sticker placed on product at President’s Choice grocery stores to let the customer know that the product is now 50% off. I save so much money in my grocery budget hunting down pink sticker products and creating delicious recipes around the items I buy. Now this year my sweet red peppers didn’t turn out so great because I planted them too late in the season so I’ve had to buy some at the grocery store. I enjoy making a roasted red pepper sauce for my chicken but I thought I would can these peppers and make my special chicken sauce that I use in the autumn/winter months. What was a huge success in my garden this year were my really hot peppers. I know finding recipes to use up hot peppers is not the easiest but you can easily make plenty of sauces that infuse the heat of the pepper into a lovely sauce or condiment. The hot pepper plants are still giving out fruit and we love spicy foods in this house. I added these little pepper beauties to the mix to give it a bit more of a kick. I find that spice brings out the flavours in other ingredients and are essential in cooking. If you like to make jam you really will enjoy making this sweet and sour red pepper sauce as it’s really simple. Not every red pepper sauce recipe has to be blazing hot either so you can control the amount of heat you add to any recipe. This sweet and sour red pepper sauce is a great way to use up the peppers from your garden especially if you have too many peppers and are scratching your head looking for recipe ideas for peppers. 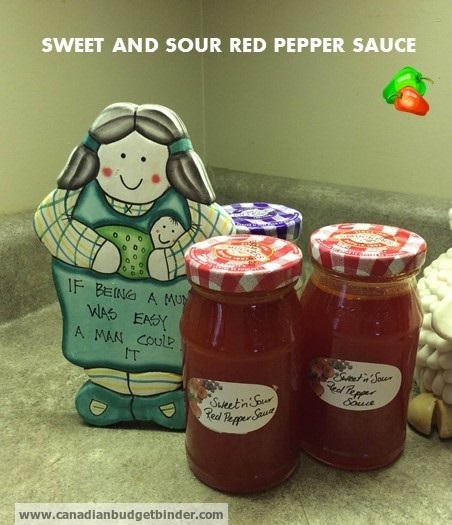 If you love to spice up your meals and have extra peppers hanging around your house try out this easy to make sweet and sour red pepper sauce. Core and seed peppers , then cut into pieces. Place in blender and pulse until it has turned to juice. Turn into a sieve over a pan to collect juice and discard pulp that is left. Pour and stir in sugar, vinegar, lemon juice and Tabasco on high and bring to a boil, stirring occasionally for about 20-25 mins. You can now add your finely chopped hot peppers to the sauce if you are adding some extra kick! Once it has come to the boil turn the heat right down and prep jars. Now have your jars ready and fill. Let stand for 12-24 hours to cool and set. This sweet and sour red pepper sauce is lovely tasting sauce to add with chicken or even a stir fry. The sauce really does taste like sweet and sour sauce you get from the supermarket. The red pepper sauce also stores really well for up to 3 months in the pantry and once opened keep in the fridge. Sounds really delicious, love this with spring rolls, which I get from a local Phillipino lady who sells them 15 for $5. Have to try this, sadly I’ll have to buy more peppers as I have chopped and frozen the basketful I bought this weekend. Thanks for the recipe Nikki. I guess I can cross out one item on my grocery list. This homemade Sweet and Sour Red Pepper Sauce must taste the one we get in the grocery. I’ve gotta try this out. What makes this more interesting is that I control how spicy the sauce is. Thanks for the recipe. You will really enjoy it! I love the sweet and sour taste you get then the slight hotness of the spicy peppers! Looks interesting Nicola!! Have to see what I can find in the reduced piles for goodies like this!! Hubby likes the hot stuff but he’s the only one here that does. I will be so glad when it cools down outside as the house gets so hot, especially upstairs. I would love to do some baking and other goodies but I just can’t handle the heat right now…. Stay cool and enjoy your time to yourself!!! You know what I could have used that pulp in my dehydrator to make a pepper powder oh well that’s a must for next time! This sauce is being used tonight with chicken served with rice mmmmm yummy ! This recipe not only sounds really good but it seems easy to make as well. I love reading recipes but the process of making long, timely recipes really throws me off. Maybe that’s a bit of my laziness coming in? Haha.